Things to Do in Dubai in 3 Days | Dubai is the kind of destination where you could spend weeks easily without getting bored of a single thing, and with plenty left to see and do! There aren’t many cities of which the same could be said. Still, if all you have is 3 days, you can still do and see quite a bit. What travellers enjoy is the charming contradiction that is Dubai; this city is a rare combination of a traditional Arabian enclave and a modern trailblazer. The two come together so easily that you’ll wonder exactly how to cherry pick the best and most wonderful for a 3-day trip but that’s what we’re here for. Here’s how to enjoy Dubai’s modern marvels along with old-world souqs and the mystical desert. Only in the Middle East could you see something like this – the desert, turned into a tourist attraction. 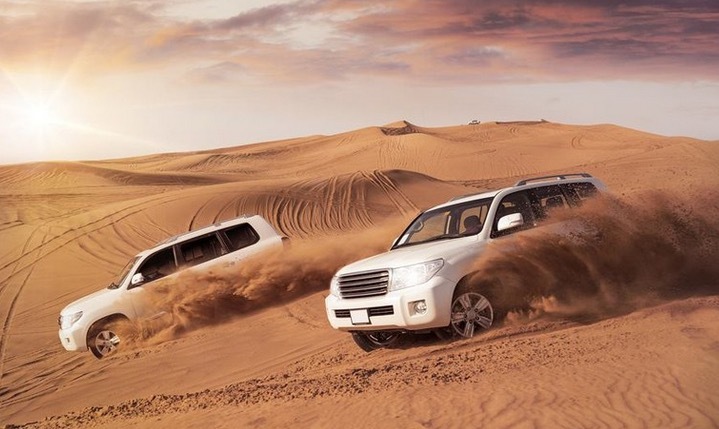 Sign up for a desert safari, and enjoy amazing desert adventures such as dune bashing and quad biking and camel riding. Rest later in a nomadic encampment before returning to base. 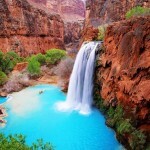 Sign up for a wonderful desert safari with a tour operator such as Rayna Tours for a blissful experience. Visit the barasti houses made of mud and palm leaves where the Emirati used to live in the pre-oil days. Check out the ancient crafts from weaving to pottery to cooking at the Heritage Village. At the Diving Village, check out the remnants of Dubai’s pearl-diving industry, which was once Dubai’s claim to wealth and fame. Bastiqaya is located on the west side of the Dubai Creek in Bur Dubai. This area is now called Al Fahdi Historical Neighbourhood. Explore the beautifully restored sandstone houses and the wind towers that used to supply cool air to the houses. 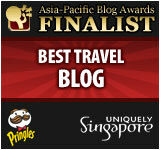 There are many art galleries and edgy cafes and traditional Arabian restaurants among the palm-fringed courtyards. 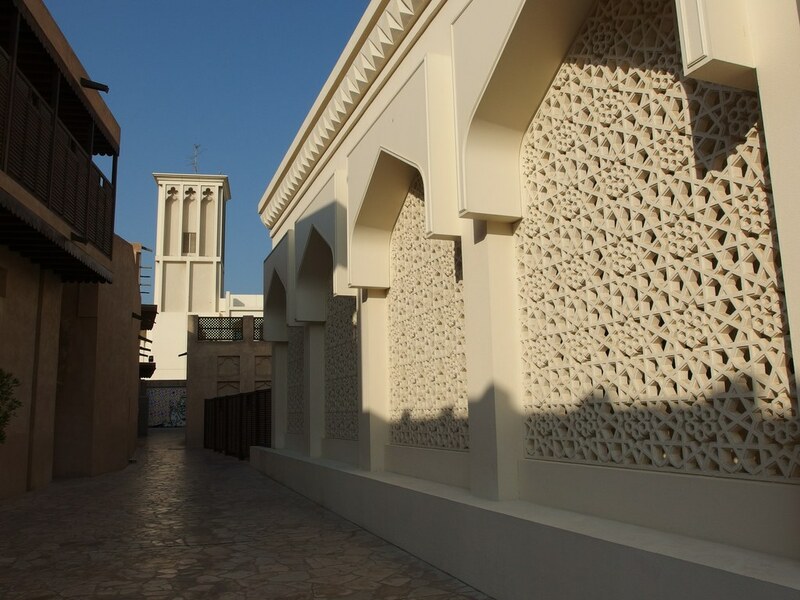 Take your time to explore this unique aspect of Dubai’s past. If you want a glimpse of Dubai pre-oil and pre-tourist, visit the Dubai Museum. 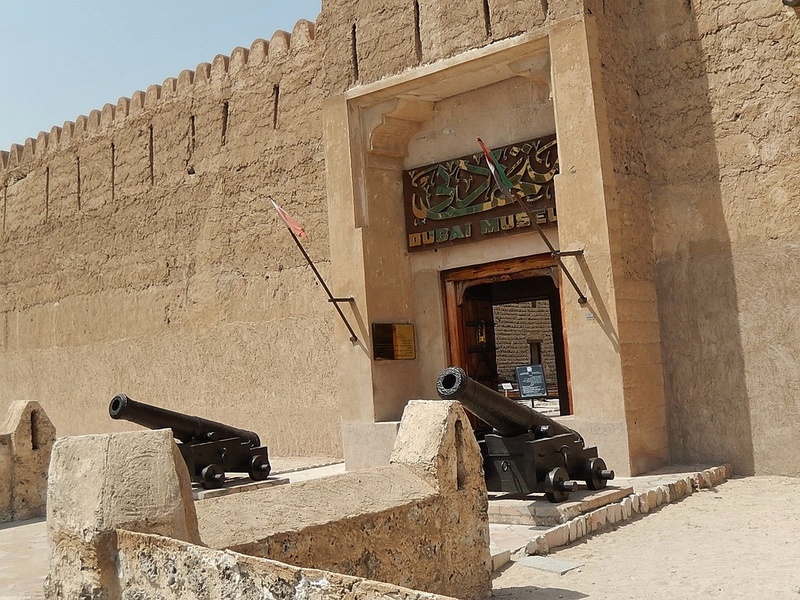 Wade through the UAE’s history and check out various examples of middle-eastern weaponry; check out the dioramas of an ancient souk and a mosque, and an oasis with a Bedouin tent and nomads strolling around. You can learn a lot from the pearl-diving industry and traditional dhow fishing dioramas as well. 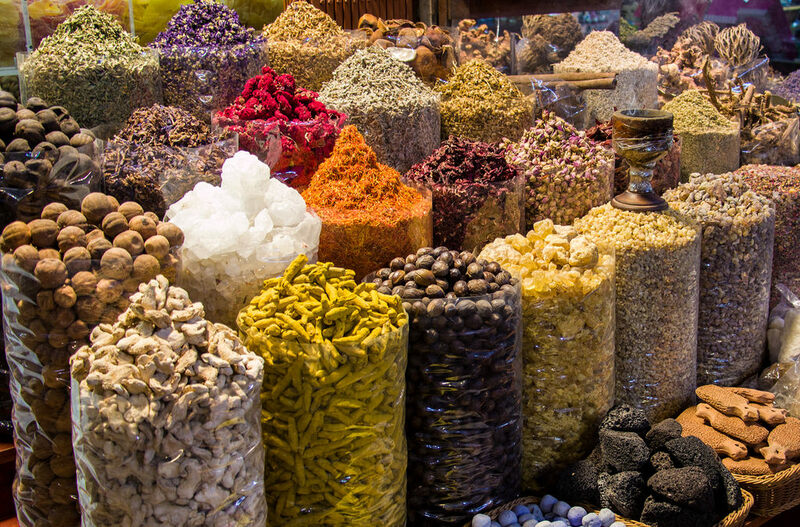 You can smell the spice and perfume souks of Deira from a distance, hidden as they are in backstreets. The gold souk however is right in the middle, glittering and shimmering among the arcaded streets. Feel free to haggle for a piece; you’ll find the traditional 24-carat gold jewellery along with 18-carat gold to please western sensibilities. 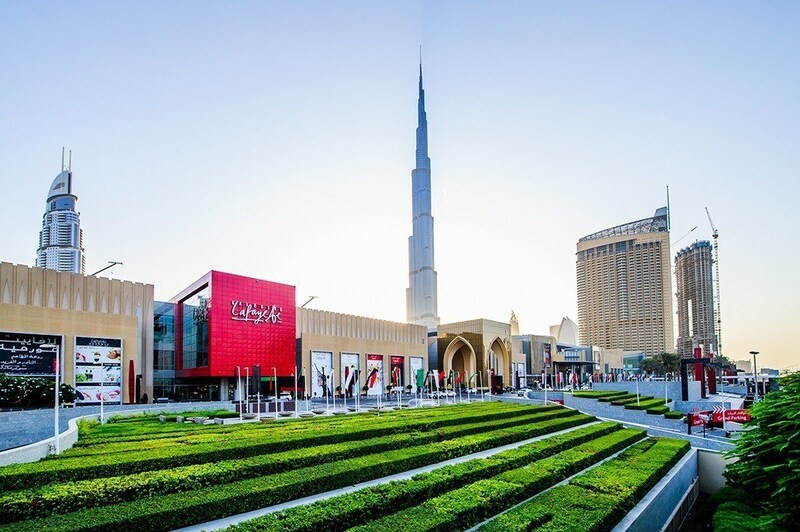 Dubai Mall is the glitziest of all malls; here you’ll be faced with a multitude of eateries, retail outlets, an ice rink, an aquarium and zoo, waterfalls, multiplex cinemas and much more. 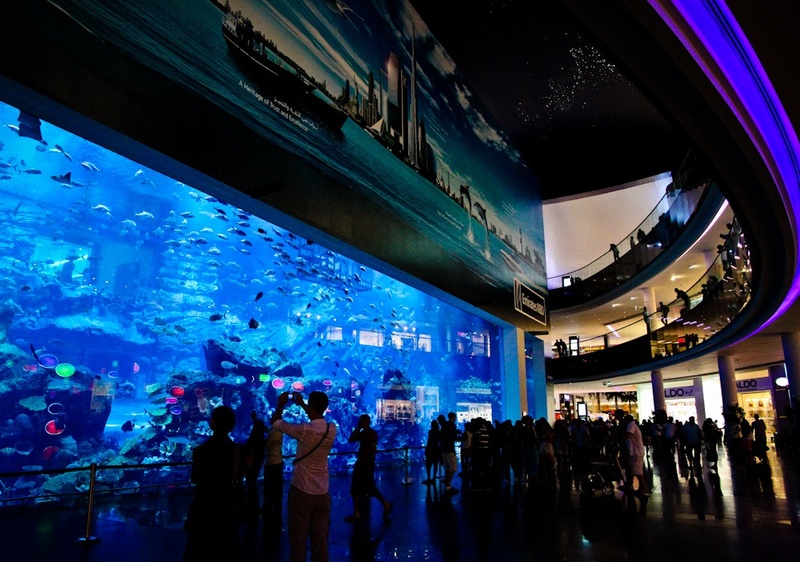 Located next to the Dubai Fountain and underneath the Burj Khalifa, the Dubai Mall is a top tourist destination. Check out top international shops such as Marks & Spencer, Bloomingdales, Galeries Lafayette, the dazzling gold souqs and designer haunts on Fashion Avenue such as Gucci and Armani. How about trekking through a 51m acrylic tunnel to come up close to 33,000 sharks, eels and manta rays? You can also get into the water and swim right on top of the gaping shoppers. Check out the marine zoo with its otter colonies, crocodiles and penguins. Experience a glass-bottomed boat ride, feed fish and get into a shark cage for a more close up experience with sharks. 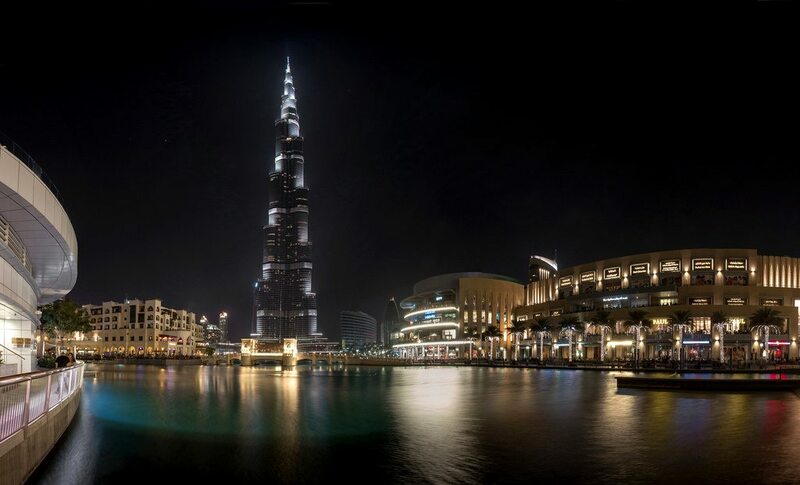 Gaze in awe at the spectacularly tall Burj, which, at 828 meters is the tallest building in the world. The Burj’s bronze-and-glass spike literally shoots into the sky. Check out awesome views of the surroundings from the three observation decks, including the world’s tallest at the 148th level. Look out at a pocket-sized Arabian Gulf, Dubai and the incredible desert far off. 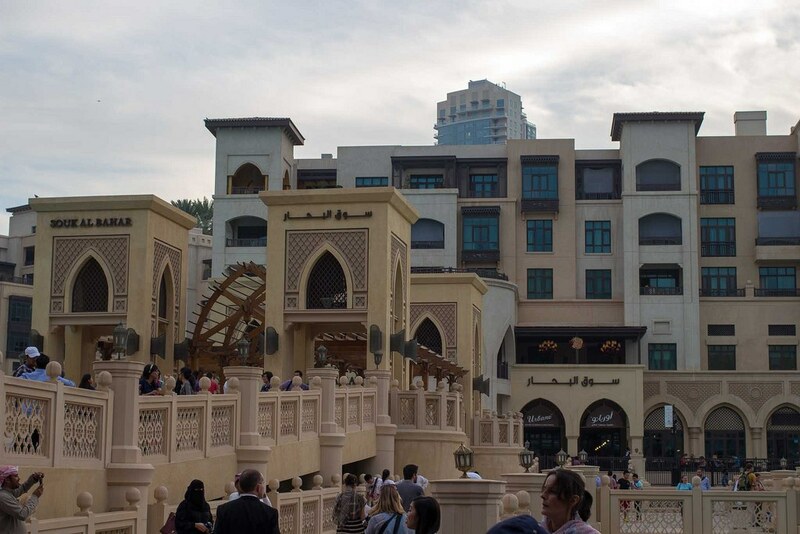 The Souk al Bahar is connected by a bridge to the Dubai Mall. Take the time to check out this totally Arabic style souk with open shops offering expensive carpets, pashmina shawls, copper and brassware, artworks, shisha pipes and more. Plus, there’s a good selection of dining and upscale drink options at the souk, with terraces overlooking the grand Burj Lake. The largest and most spectacular fountain in the world, the Dubai Fountain’s 6,600 lights stretch for 275m over the grand Burj Lake, changing hues to three choreographed performances each day. 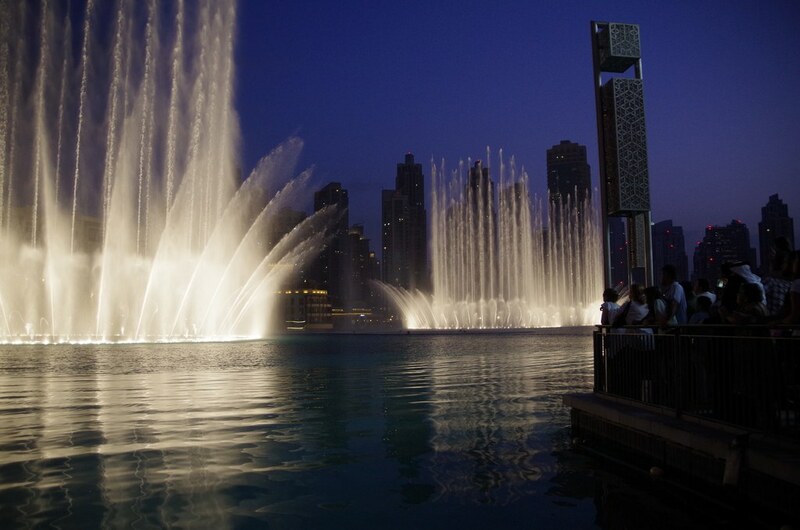 Water jets shoot up to shooting 150m into the air, weaving and moving in time to the music. 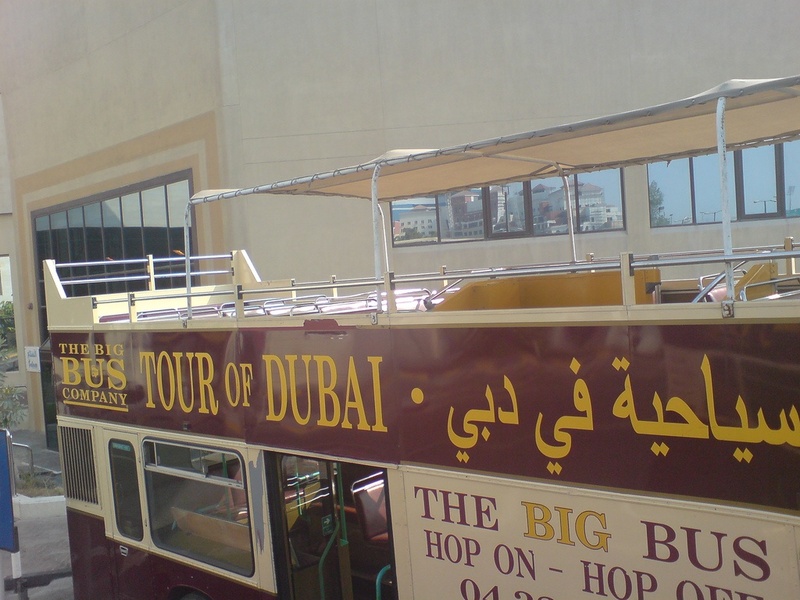 Grab a seat on Dubai’s famous Hop-On Hop-Off Big Bus Dubai Tour and enjoy a full bird’s eye view of the Emirate as the bus visits all top landmarks. Enjoy the interesting quotes and anecdotes shared by the on-board guide. 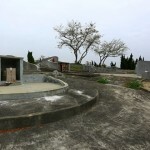 Check out over 40 different interesting places and hop off whenever you want to explore more on foot. 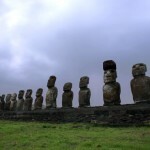 You can always hop back on the next bus in the line and continue your tour uninterrupted. Important landmarks on your route are the Burj Khalifa, The Palm, Dubai Marina, and Souk Madinat and more. 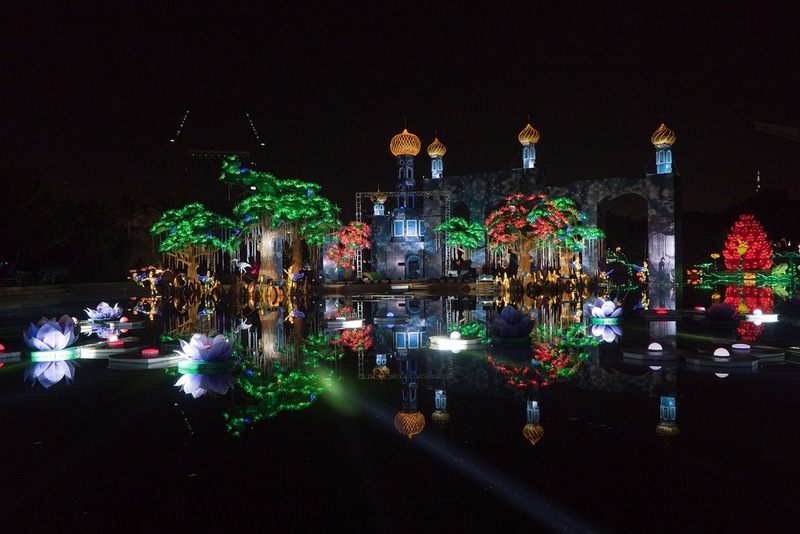 The Dubai Glow Garden in Zabeel Park is a paradise of glowing ice sculptures that depict different scenarios in each season. The first season was inspired by the Wonders of the World, and the second season was a tribute to nature with colourful trees, mountains and butterflies created out of glowy ice. Season 3 takes you on an underwater journey, complete with wrecks and everything. 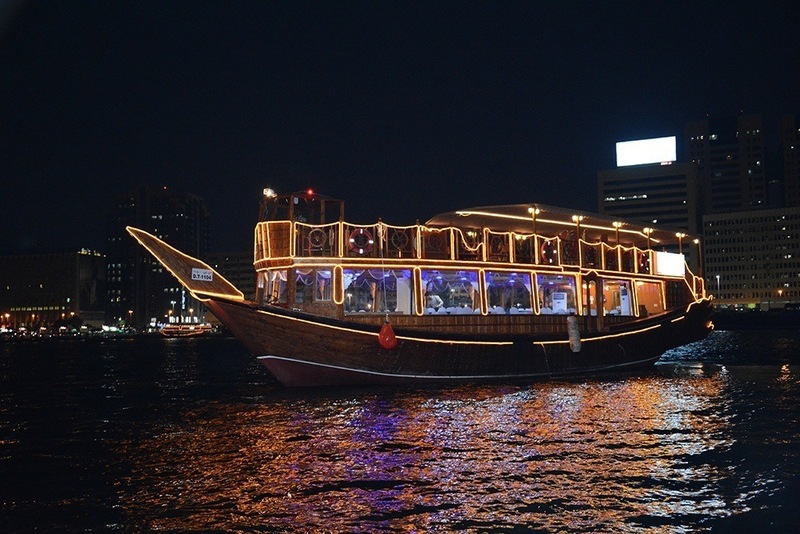 End your 3 days in Dubai with a wonderful dhow dinner cruise, either on the Dubai Creek or on the Dubai Marina. Enjoy a continental dinner on board while taking in the amazing sight of Dubai’s incredible, LED-lit up coastline. As you can see, three days in Dubai aren’t much, but if you plan it right, there’s still a lot you can do and see. You don’t have to stick to the itinerary we’ve provided. If you like, you can move things around and add other items to it. Whatever you do, don’t forget to enjoy every second of your time in this spectacular city!